Summerland's name says it all. Nestled among fruit orchards and vineyards on the western shore of Okanagan Lake, this city of 12,000 residents is perfectly positioned to take advantage of the arid Mediterranean-like weather of the Okanagan Valley. Incorporated in 1906 under the billing that it would receive "summer weather forever," Summerland's Tudor-style architecture and captivating lakeside views create the ideal setting for a summer vacation. Local attractions include the Summerland Ornamental Gardens, which houses a horticultural interpretive center. The Canyon View Path is linked to the center and offers stirring views of the Kettle Valley Railway Bridge and the famous Trout Creek Canyon. The Summerland Museum and Archives provides a glimpse back to the past with informative displays and videos about the valley's early days. Kickininee Provincial Park is a favorite destination for snorkeling fans and sunbathers. The park has three beaches bordering Okanagan Lake. During the winter, skiers and snowboarders frequent Apex Mountain Resort, located southwest of Penticton - an easy commute from Summerland. Located between the regional centers of Kelowna and Penticton on Highway 97, Summerland is a convenient stop on seasonal wine tours. 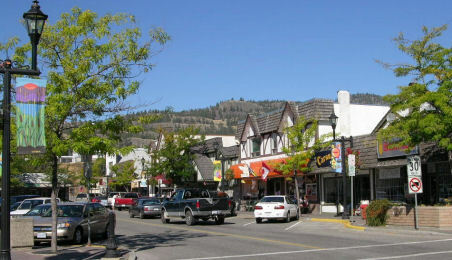 It is also an easy drive via Highway 97 to Merritt, a major center for western musical events and rodeos. Summerland hosts its own rodeos each July, when its warm summer weather is at its best.